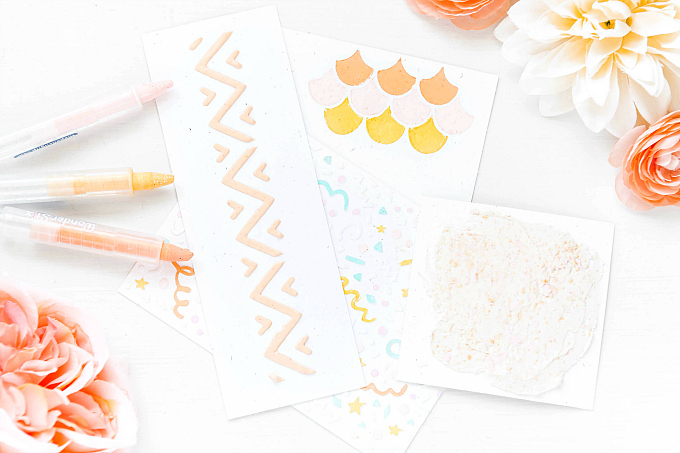 Today, I'm sharing a sneak peek into my next Monday Favorites feature. 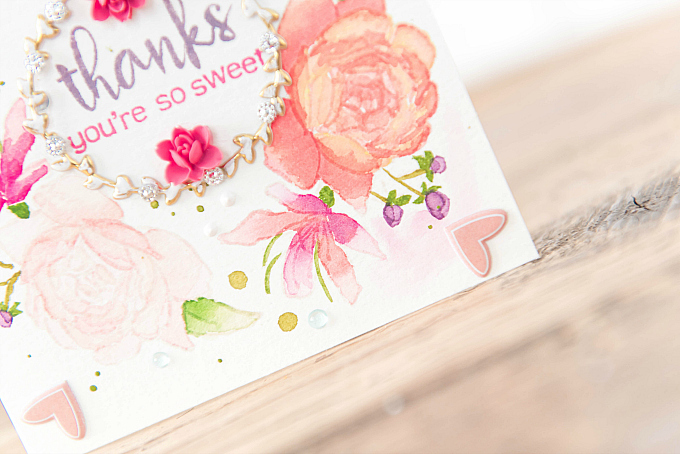 I'll be showcasing a few of my recent favorite stamps, including the beautiful Floral Frame stamp set from Aletenew. It's stolen my heart. Big time! 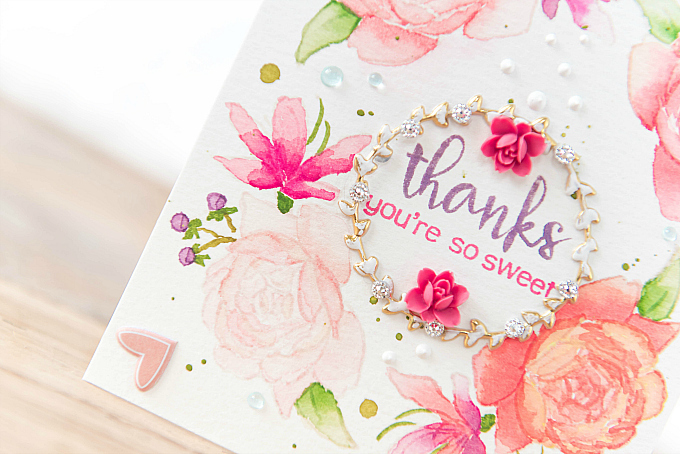 To start this card, I used the sweet rose clusters from the stamp set to make an oval frame. It took only a stamp on each corner to get it to look this intricate! Love it when stamps make it easy like that. I stamped the images with PTI's Soft Stone ink so that I could do a little bit of no-line watercoloring. To color the flowers, I used a variety of watercolors, starting with one of my favorite inexpensive palettes, followed by a bit of intense color added with my Zig markers. I really like the mix of these two types of colors - it gives the image such a nice depth. At the center of my card, I added a gold puffy sticker wreath, with a few dashes of white paint and some silver rhinestones. At the center I stamped a sentiment using the same stamp set, stamped in Winter Wisteria and Raspberry Fizz ink. 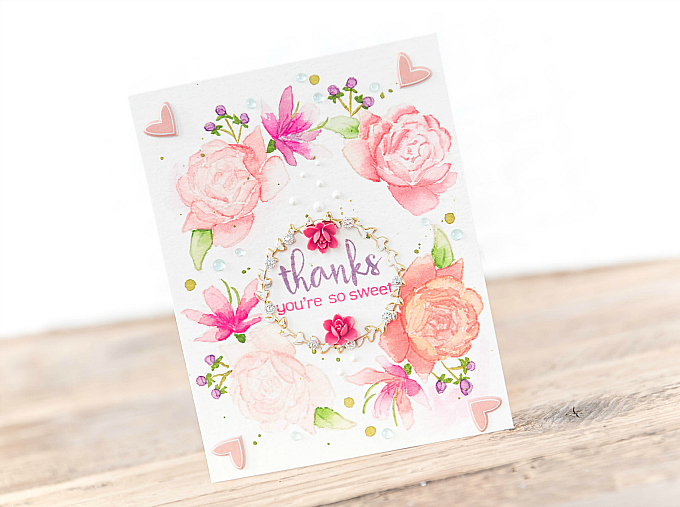 I also added a couple of cabachon roses to keep in theme with the card's design. For each of the corners, I added a little puffy heart sticker - really loving the dimension these give! Lastly, I added some paint spatters and Nuvo Crystal drops in white and Nuvo Jewel drops in Sea Breeze. 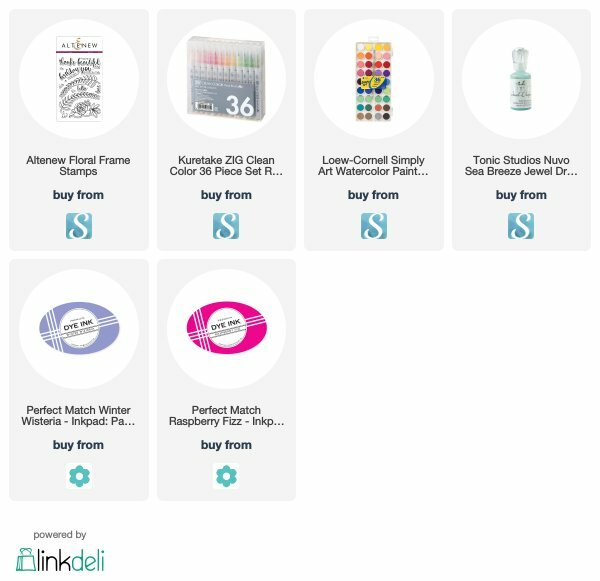 I'll be back soon to with a Monday Favorites wrap-up post on all of these yummy products and a few other favorites I'm crushing on! 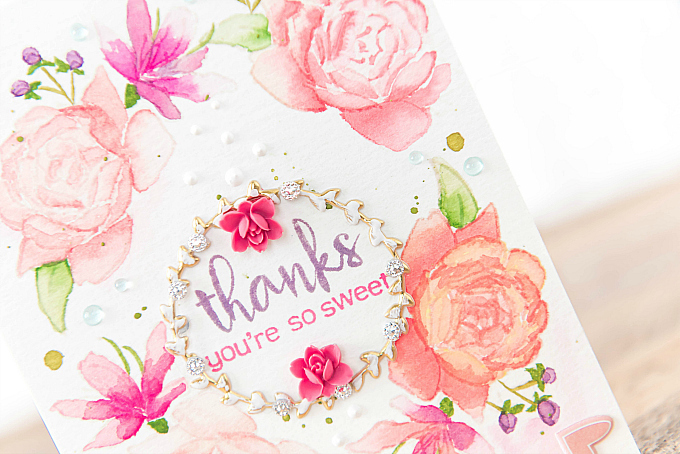 You are the queen of delicate, feminine cards! Swoon...this is beautiful!! I've been trying soo hard to work on more masculine or clean cards lately...but somehow the delicate layers always come out! I guess I just need to embrace it and go with the flow! Thanks so much for all the lovely and sweet notes you always leave for me, Lisa. I appreciate them so, so much! !